We’re die hard fans of both Dutch design and fiberoptic lighting here at Inhabitat, so it should come as no big shock that we were wowed by this gem of a light fixture designed by Niels van Eijk and Miriam van der Lubbe. Currently hanging in the atrium at Amsterdam’s SKOR (Foundation Art and Public Space), the three fiberoptic “Lace Bobbin Lamps” provide stunning light without the use of lightbulbs. Instead, their light is delivered via a remote power box — and of course we like to imagine that this type of fiber-optic chandelier would go perfectly with a fiberoptic sunlight device such as the Cold Lamp. We love the juxtaposition of the high-tech fiberoptic technology and the man-made woven aesthetic. Leave it to the Dutch to be both forward-thinking and nostalgic at the same time. Niels van Eijk and Miriam van der Lubbe have been collaborating since 1997, and are part of the Dutch design force Droog. I like them, but I would have nightmares about being externally digested by a deep sea jellyfish. The lights are beautiful I would agree that they are more like art than anything else. But you need to remember that a chandelier is typically art in a sense that its generally not a source for light and more of a statement/art piece. Remarkably Beautiful work! Andrew had previously mentioned that fiber optic lighting such as this is good for the environment. Does anyone know the wattage of the driver/ lightsource for a chandelier of this size -or- is it daylight-driven by an outdoor mounted light collector (hence, only usable during daylight hours)? Just curious. I love this innovative use of fibreoptics. Beautiful. Do you have any more examples of art/products using this technology? I absolutely love it when you feature chandeliers like this one. Hope to see more of them! I think it is beautiful, but cringe becasue I know it will never be cleaned appropriately and after a few years you will not be able to distinguish the cobwebs and dust from the fibers....or maybe that's a good thing! From our mission statement: "We believe that good design balances substance with style." Thom, I appreciate your opinion, but I do believe that this is a great example of what we believe design can and should be. Fiberoptic technology is forward-thinking, functional, and has a variety of potential applications, decorative lighting being only one. I am also a huge fan of many of the Dutch designers who constantly (and quite shrewdly) combine the high-tech and low-tech, coupling cutting-edge technologies with relateable, interactive, engaging, even old-fashioned aesthetics or techniques (the macrame-esque weaving of the fibers in this example). And lastly, you speak of art and function as if they're mutually exclusive, when in fact I think they are inextricably linked (is a functional yet beautiful building not art? Or do you believe that art is inherently UNfunctional?) Just something to chew on... Thank you for your comment, though- we love to hear from readers who initiate a worthwhile dialog. I think this design is firstly gorgeous, and secondly that it will contribute significantly to consumer's awareness of the usefulness and flexibility of fiber-optics. Chandeliers' primary reason for existence is decorative, and this design accomplishes that goal in spades, without requiring metalwork or additional light bulbs. I think that while it is not as sustainable as using another light source (ie no chandelier), that this design is far better for the environment than its traditional competition. After reading this article I had to read your mission statement to see if this design fits what it is you are trying to promote. I really don't think it does. First, to say it does not use light bulbs is fairly silly given the fact that the design uses fiber optics and it's night time. Second, how much useful light is given off by this design. I suspect that a lot of energy is used to get the effect while not giving off a great deal of workable light. I have no problem calling it art but I can't call it functional. We're die hard fans of both Dutch design and fiberoptic lighting here at Inhabitat, so it should come as no big shock that we were wowed by this gem of a light fixture designed by Niels van Eijk and Miriam van der Lubbe. 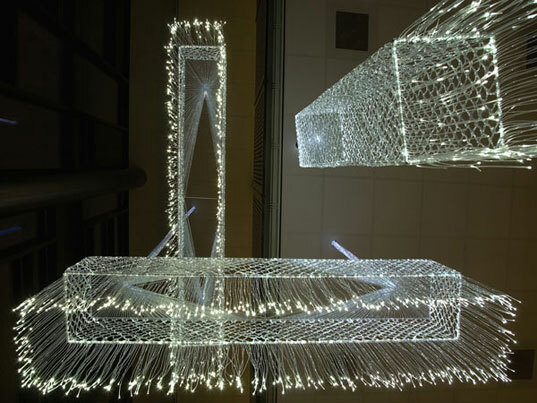 Currently hanging in the atrium at Amsterdam's SKOR (Foundation Art and Public Space), the three fiberoptic "Lace Bobbin Lamps" provide stunning light without the use of lightbulbs. Instead, their light is delivered via a remote power box -- and of course we like to imagine that this type of fiber-optic chandelier would go perfectly with a fiberoptic sunlight device such as the Cold Lamp. We love the juxtaposition of the high-tech fiberoptic technology and the man-made woven aesthetic. Leave it to the Dutch to be both forward-thinking and nostalgic at the same time. Niels van Eijk and Miriam van der Lubbe have been collaborating since 1997, and are part of the Dutch design force Droog.